A network camera can be described as a camera and computer combined in one unit. It has a compression chip, an operating system, a built-in web server, FTP (File Transfer Protocol) server, FTP client, e-mail client, alarm management and much more. A network camera, unlike a web camera, does not need to be attached to a PC; it operates independently and connects, as with a PC, directly to an IP network. It can be placed wherever there is a network connection. The network camera captures and sends live images, enabling authorized users to locally or remotely view, store and manage video over a standard IP-based network infrastructure. The intelligent network camera is never idle. It is constantly on guard, analyzing inputs and waiting for an impulse to kick-start an action or series of actions. Intelligence at the camera level enables a more productive and effective means of surveillance. Network cameras fall into categories and types. Category — Indoor/outdoor. Outdoor network cameras must have an auto iris to regulate how much light is received. Many outdoor cameras require a protective housing. Others may already be designed with a protective enclosure. Housings are also available for indoor cameras that require protection from harsh environments such as dust and humidity, and from vandalism or tampering. Types — Fixed, pan/tilt/zoom, or dome network cameras. Providing high-quality video solutions for any professional indoor or outdoor video surveillance application. The first is the traditional camera (with a body and lens) that clearly shows the direction the camera is pointing at and is ideal in situations where you want to the camera to be visible. Many cameras of this kind enable exchangeable lenses. The second type is a fixed network dome camera, which is a fixed camera installed in a small dome housing. The design, as well as the fact that it is difficult to see where the camera is pointing, makes it ideal for discreet installations. Mounting of fixed cameras is usually on a wall. This type of camera offers limited ability for changing lenses. 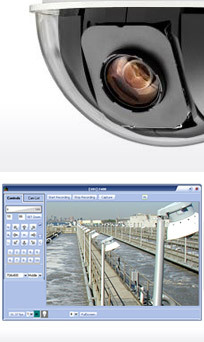 In a mechanical PTZ camera, the direction of the camera’s viewing angle is visible. Most PTZ cameras do not have full 360-degree pan and are not made for continuous automatic operations. Mounting is on a ceiling or wall. In a non-mechanical PTZ camera, a megapixel sensor is used to enable the camera to have a viewing angle of 140 degrees to 360 degrees. The operator can select to pan, tilt and zoom the camera in any direction without involving any mechanical movement. It also offers immediate movement to a new position, which in a traditional PTZ camera can take up to 1 second. The advantages include — no wear and tear, the viewing angle is not visible and it is ideal for discreet installations. To ensure a good image quality, pan and tilt should be limited to 140 degrees and zoom to 3x in camera with a 3 megapixel sensor. Mounting is on a wall. Dome cameras can cover a wide area by enabling greater flexibility in pan, tilt and zoom functions, with a 360-degree pan and a tilt of usually 180 degrees. Dome cameras are ideal for use in discreet installations due to their design, mounting (particularly in drop-ceiling mounts as seen in the picture at right), and difficulty in seeing the camera’s angle (dome coverings can be clear or smoked). A network dome camera also provides mechanical robustness for continuous operation in guard tour mode, where the camera continuously moves between presets. Mounting is usually on a ceiling. Two types of image sensor technologies are available for use in network cameras: CCD (charge-coupled device) and CMOS (complementary metal-oxide semiconductor). Each has its own advantages. CCD sensors have been used in cameras for more than 20 years and present many advantageous qualities; among them, better light sensitivity than CMOS sensors. This higher light sensitivity translates into better images in low light conditions. Recent advances in CMOS sensors bring them closer to their CCD counterparts in terms of image quality. CMOS sensors lower the total cost for cameras since they contain all the logics needed to build cameras around them. They make it possible for manufacturers to produce smaller-sized cameras. Megapixel CMOS sensors are also available, enabling network cameras to provide megapixel resolution. This technology, present in advanced network cameras, enables moving objects to be seen more clearly since it involves exposing, capturing and presenting an entire image at one time, rather than splitting an image into two separate fields, as with analog interlaced scanning technology. With interlaced technology, an image is formed when two consecutive interlaced fields of lines are presented. When objects move between the image capture of the two interlaced fields, blurriness results. This feature is incorporated into some outdoor cameras and enables the automatic removal of the infrared (IR) cut filter that is incorporated into all color cameras. When there is light, the camera delivers color video. In dark conditions, the camera makes use of invisible, infrared light present in all objects to capture images and deliver infrared-sensitive black and white video. Infrared or day/night cameras are particularly useful in outdoor environments or situations that restrict the use of artificial light. These situations include discreet and covert surveillance applications. Different types of lens are available on network cameras. Lenses may be fixed (the focal length or horizontal field of view is fixed), varifocal (allows for the manual adjustment of the focal length) or zoom (allows the camera to stay in focus when zooming in on objects). Varifocal and zoom lenses offer focal lengths that range from telephoto to wide angle. A lens’ iris, which controls the amount of light coming into the camera, can be manually adjusted (for indoor cameras) or automatically controlled (for outdoor cameras). An auto iris lens can be controlled by the camera’s processor (DC-controlled), or by video signal. Changeable lens gives users the option of using other lenses (such as telephoto or wide angle) that may be more appropriate for a particular application. You will need to know if the camera’s original lens is C-mount or CS-mount so that the new lens you purchase fits the same type of mount. Today, almost all surveillance cameras and lenses sold are CS-mount types. When choosing the size of a new lens, you will also need to know the size of the image sensor. If a lens is made for a smaller sensor than the one actually fitted inside the camera, you will have black corners in the image. If a lens is made for a larger sensor than the one fitted inside the camera, the angle of view will be smaller than the default angle of the lens since part of the information will be "lost" outside of the sensor. Network cameras come with lux specifications. Lux is the measurement unit for light. One lux is the equivalent of light from a candle. At least 200 lux is needed to capture good quality images. A high-quality camera might be specified to work down to 1 lux but this does not mean that you will get a good image at 1 lux. Different manufacturers also use different references when they specify the light sensitivity of a camera, so it is important to look at captured images to make a comparison. Two of the most common types of video compressions are MPEG-4 and Motion JPEG. MPEG-4 and Motion JPEG each employ a different technique to reduce the amount of data transferred and stored in a network video system. Each format has its advantages and disadvantages. MPEG-4 transmits only parts of an image that differ from an earlier referenced image. At high frame rates and particularly with scenes that have static areas, MPEG-4 requires less bandwidth and storage than with Motion JPEG. MPEG-4 provides support for synchronized audio, whereas Motion JPEG does not. With Motion JPEG, each image is a complete JPEG compressed image and is simple to encode and decode. One of the advantages of Motion JPEG is that it guarantees the image quality that you set (either high or low) regardless of movement or image complexity. However, Motion JPEG files are usually larger than those compressed with the MPEG-4 standard. When looking at video compression, it is important to select the compression that best suits your application. One of the best ways to maximize the benefits of both standards is to look for network video products that can deliver simultaneous MPEG-4 and Motion JPEG streams, giving users the flexibility to both maximize image quality for recording and reduce bandwidth needs for live viewing. With limited bandwidth, you may want to view at full frame rate or 30/25 (NTSC/PAL) frames per second (fps) with MPEG-4 and record with guaranteed quality using Motion JPEG. A VGA resolution is 640x480 pixels. (Computer screens have resolutions in VGA or multiples of VGA.) Another common format is 4CIF (704x480 pixels in NTSC / 704x576 pixels in PAL standard). Megapixel cameras provide high resolutions of at least 1280x960 pixels and are used for applications that require the ability to see fine details or cover a large area. A network camera’s ability to deliver a specified number of frames per second may vary depending on the resolution. There may be different frame rates specified for different resolutions. Full-motion video is 30 frames per second in NTSC video standard (in North America/Japan) and 25 frames per second in PAL video standard (Europe). Full frame rate on all cameras at all times is more than what is required for most applications. With the configuration capabilities and built-in intelligence of network cameras, frame rates under normal conditions can be set lower, e.g. one to three frames per second, to dramatically decrease storage requirements. In the event of an alarm, i.e. if video motion detection or an external sensor is triggered, the recording frame rate can be automatically increased. It is also possible to send video with different frame rates to different recipients. Video motion detection monitors changes in the camera’s field of view and if a change occurs (e.g. an intruder enters the scene), an alarm condition is generated. This function can be a built-in feature of a network camera or a feature of a video management software. Using the built-in video motion detection feature in a network camera reduces bandwidth use since no video is delivered on the network unless video motion is detected. Video motion detection residing in the DETEXI software, provides VMD functionality to network cameras or video encoders that do not originally embed this feature. A network camera with audio support comes either with a built-in microphone or an input for an external microphone. Speakers may be built in or external. An audio feature enables users to remotely listen in on an area and communicate instructions, orders or requests to visitors or intruders. Audio can also be used as an independent detection method. When sound above a certain level is detected, video recordings and alarms can be triggered. Input/output connectors enable external devices to be connected to a network camera. Inputs to a camera (e.g. a door contact, infrared motion detector, glass break sensor or shock sensor) enable the camera to react to an external event by, for example, initiating the sending and recording of video. Outputs enable the camera to control external devices such as activating alarms, triggering door locks, generating smoke or turning on lights. I/Os also allow you to save storage space. For example, if you want to simply capture the identity of a person at an entrance, you do not need the camera to continually send video. You can set up the system in such a way that the camera is triggered to capture and send the necessary image frames only when the door opens. Pre- and post-alarm image buffers within a network camera can save and send images collected before and after an alarm occurs. Once an alarm or event is detected, a network camera can send notifications via e-mail, TCP, HTTP and upload of images via e-mail, FTP and HTTP. At a basic level, a video surveillance network camera should provide different levels of password-protected access to a network camera. For instance, some authorized users may only have access to view images from specific cameras; others have operator-level access, and a few have access to administer all settings in a network camera. Beyond multi-level password protection, a network camera may offer HTTPS encryption for secure communication. IP address filtering, which allows you to define the IP addresses that have access rights to the camera, as well as the IP addresses that the camera is allowed to send video to. When a network camera supports this feature, it means that the camera can receive power through the same cable as for data. It reduces cabling requirements and installation costs. Some video encoders may offer support for IPv6 addresses in addition to IPv4 addresses as insurance against the growing shortage of IPv4 addresses. 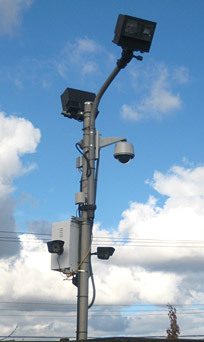 Network cameras may be specially designed to be tamper or vandal resistant. These kinds of cameras are useful in areas where they may be vandalized. For some network dome cameras, a specialized feature may be the ability to use a joystick for pan/tilt/zoom control. How can one guarantee good image quality? Image quality is clearly one of the most important features of any camera, if not the most important. This is especially true of security surveillance and remote monitoring applications, where lives and property may be at stake. But how can one guarantee good image quality? That is a frequently asked question when specifying a new system, which involves sourcing and installing new network cameras. Not all network cameras are created equal. A key determinant of a network camera is image quality. When assessing image quality, be sure to consider a network camera’s light sensitivity, the crispness of moving objects and the level of clarity. Read through a camera’s datasheet and, most importantly, field test a few cameras before making a decision. Before you set out to order or buy many network cameras, it is a good idea to buy one and test its quality. Try out a network camera with a demo version of DETEXI video management software, which is downloadable on this’ web site at Licensing Section. DETEXI demo version provides simultaneous viewing and recording of high-quality video from a single surveillance camera. Once the camera is selected, the next step is to select the appropriate lenses, housings, and any other relevant components necessary in the system. The installer should also be aware of a number of common practices related to camera positioning, which will help in obtaining the best quality out of the system. These are equally applicable to network cameras as to any other type of camera. The most common reason for poor quality images is a lack of light. Generally, the more light, the better the images. Bright areas in the images should be avoided. Bright images might become overexposed (bright white) and objects can then appear too dark. This problem typically occurs when attempting to capture an object from behind a window. A camera adjusts the exposure to obtain an average level of light in the image. When trying to capture an image of a person standing in front of a white wall, the person generally tends to appear too dark. This problem is easily solved by substituting the background color for gray instead of white. An auto iris lens should always be used for outdoor applications. An auto iris lens automatically adjusts the amount of light that reaches the image sensor. This optimizes the image quality and protects the image sensor from being damaged by strong sunlight. Direct sunlight should always be avoided in an image. Direct sunlight will blind the camera and permanently bleach the small color filters on the sensor chip. If possible, the camera should be positioned facing the same direction as the sun. Viewing too much of the sky results in too much contrast. The camera will adjust in order to achieve a proper light level for the sky. Consequently, the object/landscape of interest will appear too dark. One way to solve this problem is to mount the camera high above the ground; using a pole if needed. Sturdy mounting equipment should always be used to avoid vibrations caused by strong wind. If the camera is mounted behind a glass, such as in a housing, the lens must be placed close to the glass. Otherwise, reflections from the camera and the background will appear in the image. To reduce reflection, special coatings can be applied on any glass used in front of the lens. When using cameras at night, additional external lighting may be required. This should be arranged to avoid any reflections and/or shadows. For covert security, Infrared (IR) illuminators can be used instead of normal lighting, known as white light. Color cameras do not work with IR light. Some cameras are able to automatically switch between a daylight color mode and an IR mode useful in night vision where the image will then appear without colors. Video management software is an important component of an IP-Surveillance system because it effectively manages video for live monitoring and recording. A network camera with an open, application programming interface enables a large variety of software vendors to write programs for the cameras. This increases the choices in software applications and ensures that you are not tied to a single vendor. Your choice of network camera should never limit vendor options and functionalities. Find out if the network camera is able to work with a video management software of your choice.